Dr. Antesh Kamla Yadav has completed his M.B.B.S from RCM, LONI- India. He is qualified with a D.N.B (Diplomate National Board) in Pathology from MOH, SIR H.N Hospital and a D.C.P (Diploma in Clinical Pathology) from DR.V.M.GMS Solapur. 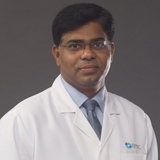 Dr. Antesh Kamla Yadav has interest in playing football and reading.